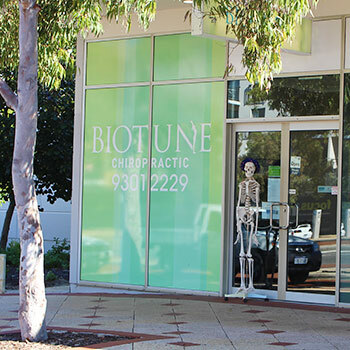 What Sets Biotune Chiropractic Apart? Biotune Chiropractic is a unique health facility unlike anywhere you may have been before. You might be wondering why you should choose us over another clinic to address your needs. Please read through our website and the material below to learn a little more about our approach to caring for you. The treatment plan you receive from your chiropractor is tailored to you. With our patient-centred approach, you will fill out a goal card that shows us exactly what you want from your treatments, whether it’s symptomatic relief for a painful injury, or a more specific priority such as performing a certain requirement for work, sports and play. We’ll customise our focus to your concerns, and you’ll feel well-supported with our approachable staff that listens carefully to you. Know that you’ll receive all the time and attention you deserve at Biotune Chiropractic. Longer appointment times allow us to provide muscle work along with chiropractic adjustments. A variety of soft tissue therapies are available that can be tailored to your requirements. Our holistic approach treats your entire body, including shoulders, ankles, knees and other extremities, not just your spine. Keeping up to date on the latest research allows us to use the latest advances in the health field to your benefit. The Biotune Chiropractic team of chiropractors meets weekly to review current techniques and give each other chiropractic adjustments. Not only do we practice what we preach by maintaining physical health, but we also make sure that no matter which practitioner a patient sees, they have a similar experience. When you’re in trouble after hours, Biotune Chiropractic is here for you. Contact us today to find out more!